I already had one Organic Bubbles, I had bought this early on as I was finishing my very first bracelet. I decided this would be a good multiples bead for my Rocky Beach Bracelet, and as these things sometimes happen, within the space of a few days I went from 1 to 4! 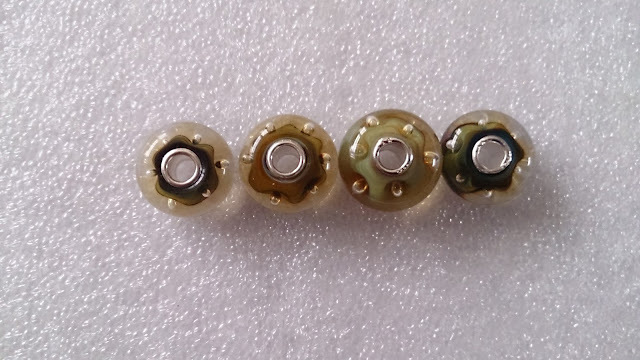 I suggested a swap between myself, a friend and another seller as both had beads to buy and sell that weren't compatible for a straight swap, however with what I had to offer and what I wanted in return it would work as a 3-way swap. A Light Turquoise Prism was sent to my friend, who sent Organic Bubbles to me and I in turn sent a Pink Bud to the original seller - Result! 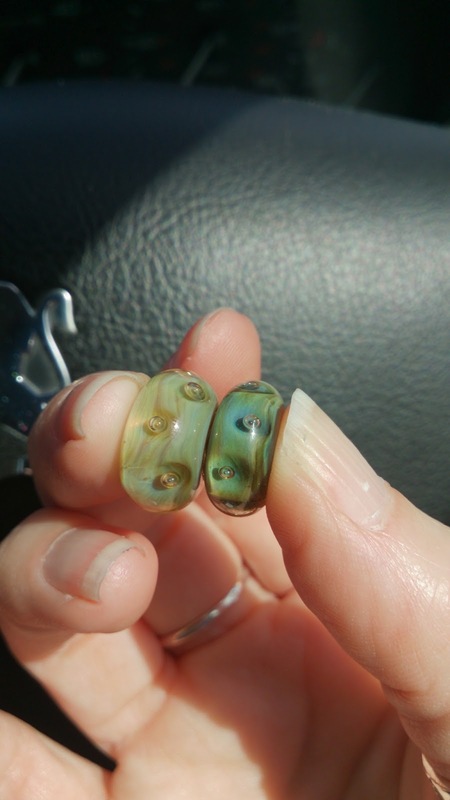 As you can see my swap bead is darker and plumper than the one I already have and the bubbles run down the centre rather than the pattern you see on my other two beads. 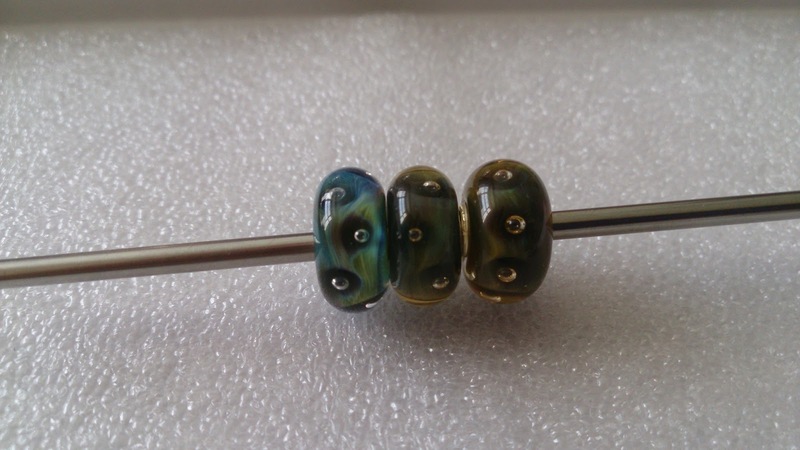 I love the great variations you can find with Trollbeads, my next 2 beads arrived together and were bought on a whim because of the amazing colours. They are really unusual and great for my Rocky Beach Bracelet; although they hadn't arrived in time to be photographed for the original blog post. I was so pleased with these beads, that having missed the delivery I had to take a quick shot when I picked them up from the depot to show my friends before I got them home, it was a beautiful sunny day which really showed off their colours, a lovely "muddy green", great for representing UK winter rock pools and really unusual to come across two at the same time. So now I have four, and I only need three for my current project - oh well, you can never go wrong with having a spare! That side view really shows off the differences! Fab! do you have the organic stripe to go with it? That, along with pretty much everything else, is on my wish list! 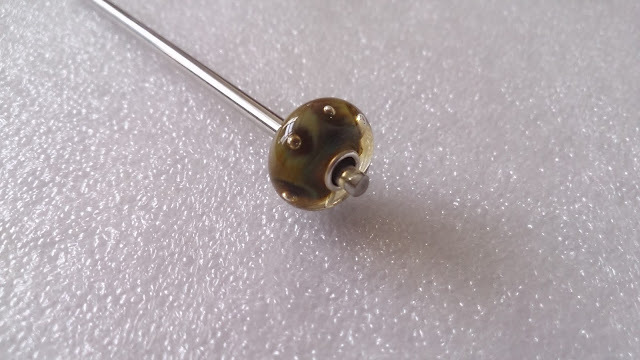 Hi Mike, it's not a bead that's come up on my radar from the stock photo of it but then again I've never seen one in real life! I love the small bubble beads, there's a lady in the Google+ Trollbeads Community who pretty much has a bracelets worth of Azure Bubbles, all stunning! I've been wearing Purple Stripes (with a few others) today on a leather, one of my favourites of the stripes beads! I have a bit of a thing for Azure Bubbles too ;) It's the whole swirly dark blue, purplies that do it for me. We can cling on together then... There are some great prices and beads on that sale, was peeking through one hand as I was scrolling through with the other! I think the Azure Bubbles are gorgeous, given I've embraced my multiples disease I'm still a bit confused as to why I only have one of these. I have been looking through some old bracelet photos to put up on facebook and I've realised how much I've enjoyed seeing both azure and organic bubbles in use, think they got a bit neglected in the middle of my collecting! 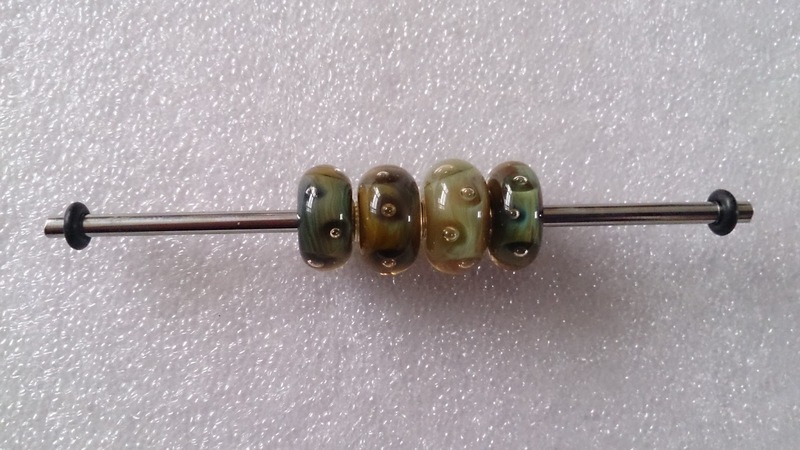 Probably due to the volume of collecting, with so many new and shiny beads I've neglected some old favourites. Yep I think it's due to all the new things :( I often look through my bead box and think "oh I wanted more of that" or stumble across images and remind myself of a bead I was meant to buy.. But then a new release hits and suddenly everything is shiny new. Plus as a blogger you're inclined to try and get new products to feature on the blog, right? Yep think you've hit the nail on the head with the blogging having some influence on buying newer releases earlier than perhaps I would have without the blog. Biggest exception being Ruby Rock, love that bead, and I like the grey ones, but I still have only 1 for now. I picked up a lovely fat silver ring at the festival this weekend set with Ruby Rock (smooth and polished so looks completely different), even though the stall holder said it's not a great example I love the effect... and I didn't know it was Ruby Rock, I was just drawn to the stone even though I was working my way through 3 trays of great rings!